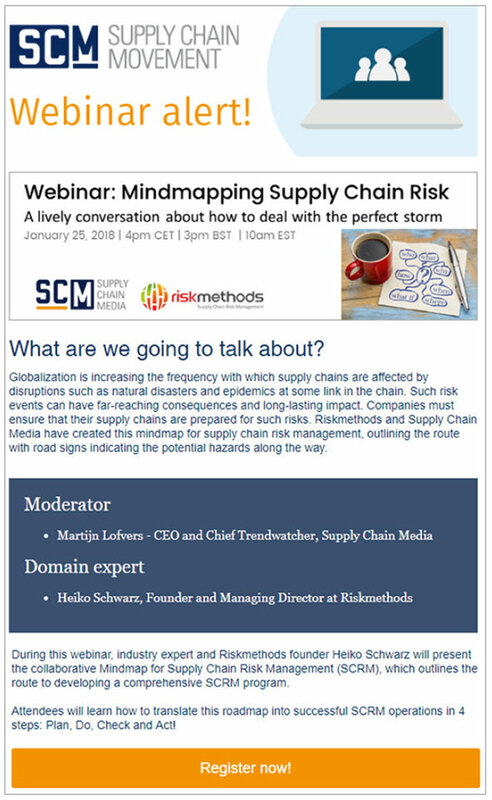 Riskmethods and Supply Chain Movement have created a mindmap for supply chain risk management, outlining the route with road signs indicating the potential hazards along the way. During a webinar, industry expert and Riskmethods founder Heiko Schwarz presented this mindmap and explained to translate this roadmap into successful SCRM operations in 4 steps: Plan, Do, Check and Act. The webinar was moderated by Martijn Lofvers, CEO & Chief Trendwatcher at Supply Chain Media, resulting in an interactive ‘radio’ talk show.